Konnis designs and manufactures Tecan compatible parts, carriers, racks, and adapters that can move from the bench to the deck to enhance assay efficiency. Our parts are manufactured with very tight tolerances that can be reproduced for consistent quality, essential for automated liquid handlers. Konnis designed a modular adapter system that allows carriers and racks to be used either directly on the deck or in combination with flat adapter plates. This interchangeability reduces human error, simplifies the deck set up, and eliminates extra movement of carriers and racks to streamline the assay automation process. In-house design and production lets Konnis offer these unique Tecan compatible carriers, racks, and adapters with an exceptional turn around time and for a reasonable price. Call or email us your automation challenge and we can design the solution. SBS form factor adapters for tubes and plate will fit any automated liquid handler. Instrument specific parts such as arm components, racks, and deck carriers are readily available and are compatible with Tecan, Hamilton, Beckman, PerkinElmer instruments. Contact us for more information on SBS carriers for your instrument or bench. The Konnis machine shop, with on-site machinist, offers a unique added value that only Konnis can bring to your automation process. 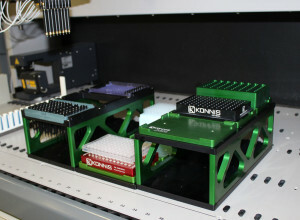 Computer aided manufacturing allows special parts and custom carriers to be developed quickly and accurately reproduced. This gives Konnis a greater degree of freedom in our approach to assay automation.